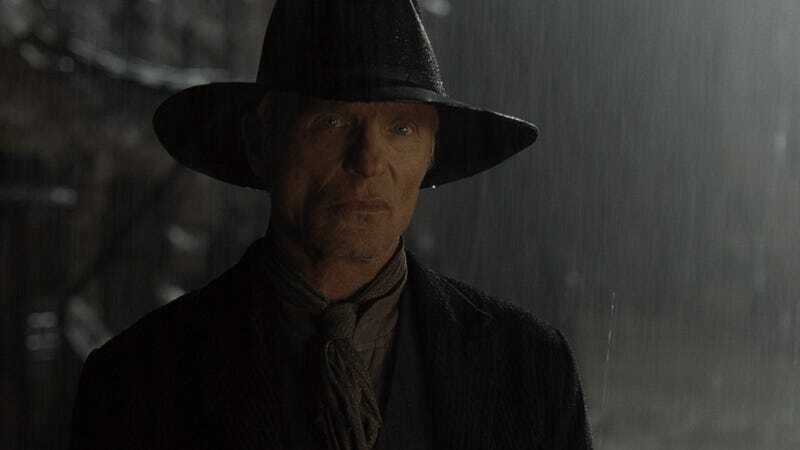 I think I’ve got you figured out, William (Ed Harris). The latest episode of Westworld was one of the finest we’ve gotten on the series so far. Directed by showrunner Lisa Joy, it confirmed one ongoing fan theory, only to have the door blown wide open on another. io9's Beth Elderkin and Gizmodo social editor Joe Tonelli discuss whether William’s game is bigger than we ever could’ve realized. Join the debate! Discussion points below. 1. We’ve gotten confirmation that Delos was trying to replicate the human consciousness in a robot, using company founder James Delos (Peter Mullan) as a test subject. Why do we think the experiment failed, and what will it take to make it a success? 2. What’s Peter Abernathy’s connection to what’s going on with James Delos? Peter’s got the same code in his head, what did Charlotte put in there? 3. Whose “brain” did Bernard create while under (seemingly Ford’s) control? 5. Perhaps the biggest question of all, one I never thought I’d be seriously asking on this show: Is William a host now?